Since the late 1970s, Renée Van Halm has source-mined architecture of the mid-century Modernist strain, taking on a critical analysis of Modernism by way of immersion. Lean Back, her current exhibition at Birch Contemporary, proves no exception. 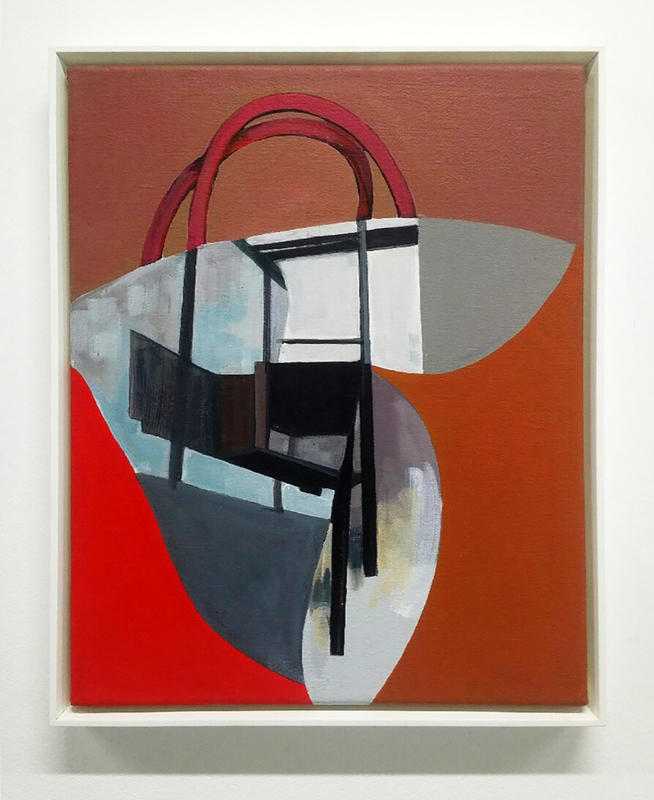 Eleven modest-scale acrylic paintings continue Van Halm's modus operandi of working from photo-collages of images lifted from decor and fashion mags. Take for instance, Loops, 2016, one of the small pieces (15" × 12"). The painting (pictured below) exudes the bright optimism of Modern decor with its striking red and orange hues that surround a biomorphic form topped by what could be mistaken for a shopping bag handle. This collage is consumerism contained: home furnishings from an obvious chair to more nebulous abstractions of what pre-appropriation may have been walls or cabinetry. Revealing an underlying cool austerity if not outright bleakness to the shiny new interior(s) are the muted colours and the absence of people. Yet the piece remains largely a Modernist abstraction itself, and thus a critique spawned from affection. Van Halm takes a Derrida-reminiscent deconstructive tack that stands true to the philosopher's often misunderstood methodology: a breakdown rather than a takedown.